The Impact analytic tool requires scores in your data eg. Net Promoter Score (NPS) or 1-5 star rating. The Impact analytic tool displays the scores and effect on score of each base and sub-themes in your data. What are the different types of impact scores? and how are they calculated? The left section shows the impact of the base themes in your data and the total score. The middle section shows the impact of the sub-themes in a base theme. 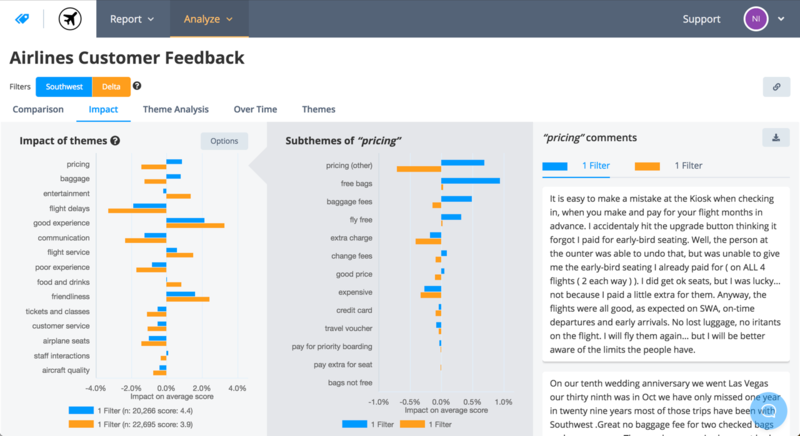 The right section shows data examples of a theme, which can be scrolled through. To see the exact impact and volume of a theme, mouse over it. To see the sub-themes of a base theme, click on the base theme's name. To see data examples of a base or sub-theme, click on the theme's name. To see more information about a data example (all tagged themes or score), click on it. You can view either the impact of each theme on the score or the average score of each theme using the options menu. Impact: The impact on the total score from comments tagged with the theme. Average score: The average score of just comments tagged with the theme. By default themes are sorted by the biggest impact score, but you can change that using the Options. Comparison difference can be used when filters are applied to sort by the greatest difference in a themes impact in both filtered sets of data. Applying a score filter will only affect the displayed comments since impact can't be calculated using only a section of scores. Adding an orange filter will add orange bars show the theme impact in the orange filtered set of data. The data examples can be changed to show examples from either filtered set of data, change between them by clicking the filter color at the top of the section. Downloading theme data with two filters applied will give an option for either filtered set of data. Themes will be sorted by greatest impact difference, which you can change using the options. 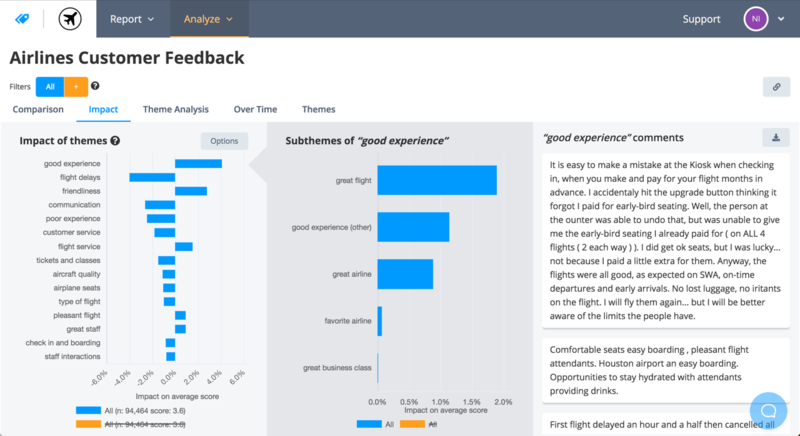 The Impact tool calculates NPS or other score type using only responses with a score and text comment and doesn't consider responses with no comment.